The Carver 31 Montego has an 11 foot beam, a stepped swim platform with built-in seat, a roomy cockpit with very comfortable helm and passenger seating, and a centre companionway entrance to the cabin. The cabin is open, bright and spacious with sleeping for 6 between the V-Berth, mid cabin and convertible dinette. 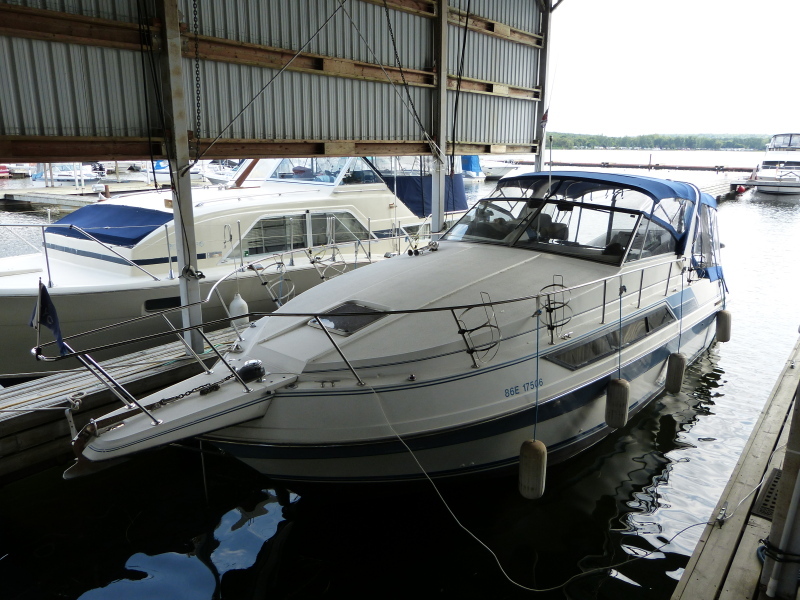 This original owner 31 Montego is equipped with the upgraded Volvo AQ740 454 engines with Duo-Prop outdrive. She has new canvas and cockpit carpets, is covered-slip kept and in very good overall condition. Pricing reflects higher hours on the power plant, however, the engines have been professionally maintained over the years, are currently running very well with good compression readings, and require no immediate attention. The package includes a Zodiac soft-bottom dingy with Nissan outboard.